Toronto and London listed exploration and development company EMED Mining said on Tuesday it found significant potential new copper deposits near its Cerro Colorado open pit operations in Spain, sending its shares up over 5% in afternoon trade. 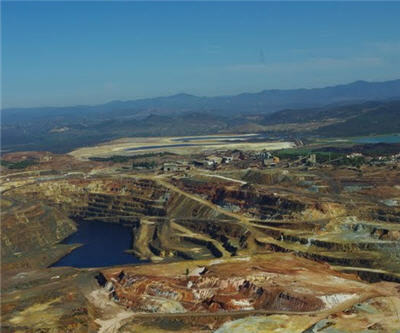 In May the Cyprus-based company announced Andalucia, one of Spain's autonomous regions, gave approval for the plans to restart its flagship Rio Tinto copper mine, which was placed on care and maintenance in 2000. Production is scheduled to start in 2012 following further approvals. The company referred to drilling results "worthy of assessment" at the San Dionisio underground deposit carried out back in 1993 that estimated geological resources containing approximately 250,000 tonnes of copper. Read the full press release here. Picture of the Cerro Colorado pit looking northwest courtesy of the company.